45% Merlot, 45% Cabernet Sauvignon, 10% Cabernet Franc. To begin with, the color of this wine is an astonishingly dense, black garnet. A burnished, earthy red. One is immediately treated to spicy plum & licorice on the nose, followed in time with the subtlest undercurrent of caramel. Excellent red fruits of cassis, currant & plum along with lush fig and truffles create a beautifully soft mouth feel. As it opens, dark chocolate overtones. Subtle perfume. Coffee liqueur. 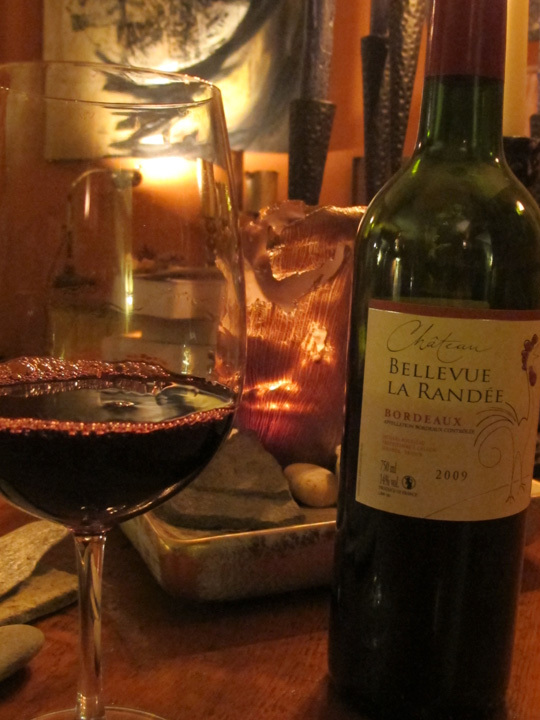 With generous amounts of earth and well balanced tannins, this 2009 vintage is expressive & powerful, and an amazing value. I love this wine! One must always try a wine on day 2 or 3 (if possible!) to see how it holds up. La Randée truly opened up even more with time and I suspect this vintage would be a good one for the cellar! Enjoy with a luscious beef stew ... or boeuf bourguignon in true French style! This wine may be found at Old Port Wine Merchants, 223 Commercial St., Portland, ME. Next blog, a little background info about the winemaker, Jean-Luc Thunevin! Great description...must be all those critiques in art school. Ive enjoyed this wine many times ! Looking forward to passing through the blog and keeping updated on some good drink... one suggestion/request ? Would you be so kind to tell us from which distributor the wine is coming from. Ha - Thanks Luke! I'm glad you've discovered this wine already - a testament to your palate! It comes from Central Distributors via MS Walker (the supplier).